I love to find old hook-and-bullet magazines, the older the better, and read the old-school gun writers. I like the grainy black-and-white photos shot in the field. I like the horn-rimmed glasses, canvas shooting jackets and the Jones hats they wear. 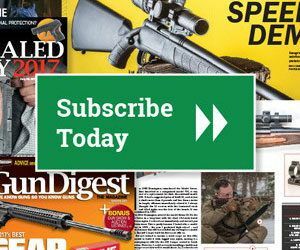 Some of these writers have penned stories for Gun Digest over the years. Terry Weiland, shooting editor at Gray’s Sporting Journal, curated some these writings for Classic Sporting Rifles, a collection that is a “who’s who” of gun writers from the twentieth century. And such a collection would be incomplete without something by Jack O’Connor. His 1958 article that is included in the book, “The Sheep Rifle,” makes an argument about what kind of shots are actually taken while pursuing sheep (shorter than you think) and what rifles are suited for the job. O’Connor is known for being a strong advocate for the .270 Winchester but the last custom rifle he owned was a .280 Remington Ruger M77. It’s an interesting story of a gun writer and his relationship with a gunsmith and the masterpiece rifles they envisioned and created.